Our Culver City car accident lawyers and law firm provide expert personal injury legal services for those injured in auto, motorcycle and other accidents, and for the relatives and families of those killed in car and other fatal accidents for wrongful death claims, in Culver City, California, a city located in western Los Angeles County, California. If you had a car accident or other personal injury claim in Culver City, West Los Angeles or anywhere in California, please contact our car accident injury attorneys and legal team now for a completely FREE CONSULTATION. For additional helpful information, please visit our updated and comprehensive Car Accident Web Site simply by clicking here. Culver City, home to motion picture studios, is bounded by the Los Angeles neighborhoods of Baldwin Hills and Ladera Heights to the east, Venice and Playa Vista to the West, and Mar Vista and Palms to the north. According to the 2010 United States Census, the City has a population of more than 38,883 residents. 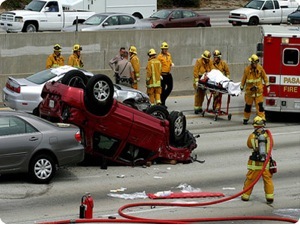 A Culver City car accident can lead to serious injury and be extremely dangerous for the victims involved so it is very important to have a skilled and knowledgeable car accident lawyer on your side. We have more than 40 years of handling car accident and other personal injury cases in Culver City, Los Angeles and throughout California and our success has given us the respect and recognition of PERSONAL INJURY LAW FIRM OF THE YEAR. Two of our senior attorneys, Robert Walch and Gary Walch, were each selected as Top Lawyers in California (Highest in Ethical Standards & Professional Excellence). Drivers who experience minor accidents with no serious injuries should move cars to the side of the road and completely out of the way of oncoming traffic. Leaving cars parked in the middle of the road can result in accidents and serious injuries. If a car cannot be moved, it often is best for drivers and passengers to remain in the car with seatbelts fastened until help arrives. If possible, make sure to turn on hazard lights and, if safe to do, set out cones, flares or warning triangles. After the accident, make sure to exchange names, address, phone number, insurance company, policy number, driver license number and license plate number for the driver and the owner of each vehicle. Our aggressive but compassionate lawyers and staff have resolved many thousands of cases and work extremely hard to make the claims process effortless and uncomplicated for our clients, the victims and their families. We invite you to visit our new and updated Car Accident Web Site. The Walch Law Corporation has effectively recovered more than $100,000,000.00 in funds for its clients and provides instant help with medical care (regularly without any payment until the case is resolved), specialists, property damage repair and settlement. Our car accident injury lawyers invite you to read our Car Accident Testimonial Pages simply by clicking here. One common and familiar injury that victims of car accidents suffer is whiplash. Whiplash is a term describing a variety of injuries to the neck caused by a sudden and irregular motion to the neck. A whiplash injury may be the consequence of abnormal stretching of the spine, mainly the anterior longitudinal ligament (the ligament that runs down the anterior surface of the spine) which is extended or tears, as the head snaps backwards and then forward causing a whiplash type injury. These motions push the neck muscles and ligaments beyond their normal range of motion, causing injury. The most frequent signs related to whiplash injury from accidents include neck pain and stiffness, headache, shoulder pain and stiffness, dizziness, fatigue, jaw pain, arm pain, arm numbness and weakness, visual disturbances, ringing in the ears and back pain. Proper medical care is crucial and our firm is able to contribute names of numerous doctors to treat such problems without any advance payment. The Law Offices of Gary K. Walch provides you with the successful advocacy that you need when you or a loved one has been through an overwhelming car accident or other personal injury accident in Culver City, Los Angeles or anywhere in California. Our profession is based on representing your interests and aggressively pursuing your rights. Our staff handles accidents involving car, motorcycle, truck, bus, train, bicycle, pedestrian, hit and run, uninsured motorist (UM) and much more. Call us for an absolutely FREE consultation to review and analyze your car accident or other personal injury case. For your convenience you don’t even need to leave the comfort of your own home. Just like many of our clients you can do everything by telephone at 818-222-3400 or toll free 866 INJURY 2 (465879 2), email (info@WalchLaw.com) or simply complete our very easy to use contact form.